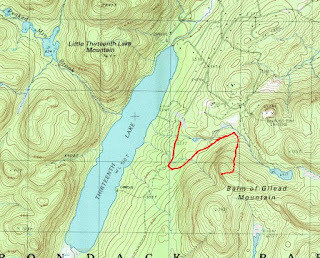 Here's an area that offers a nice lake with lakeside camping and a choice of trails to peaks of various distances and levels of difficaulty. 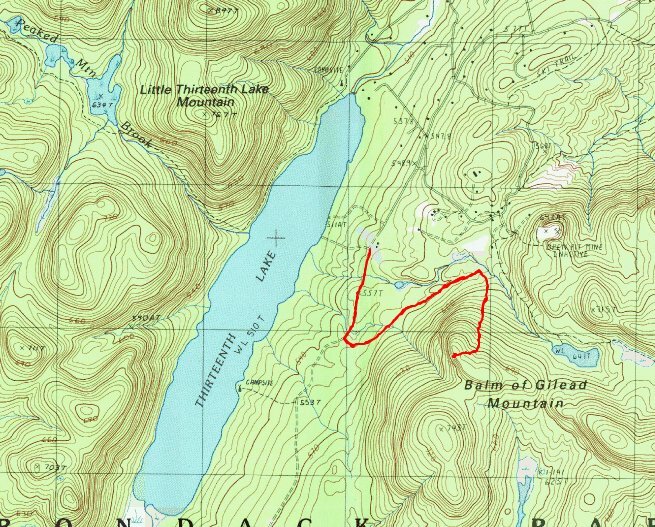 The easiest of those hikes is a short hike that offers a pretty good bang for the buck - Balm of Gilead Mountain. The total length of the hike, out and back is 3.3 miles and the vertical gain is only 600', but don't let the meager stats fool you. 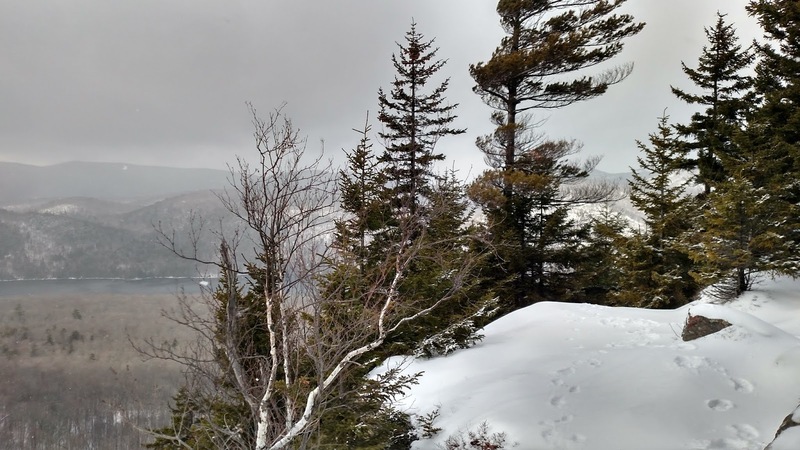 The summit of Balm of Gilead Mountain has a ledge which offers great view of Thirteenth Lake. You can access the northern end of Thirteenth Lake by a 2 minute walk form the end of Beach Road. This is also the trailhead for Peaked Mountain. You can camp lakeside and also launch boats easily from Beach Road... in fact we saw a person doing it on January 2nd! We stopped at the lake just to take a look before beginning our short hike. 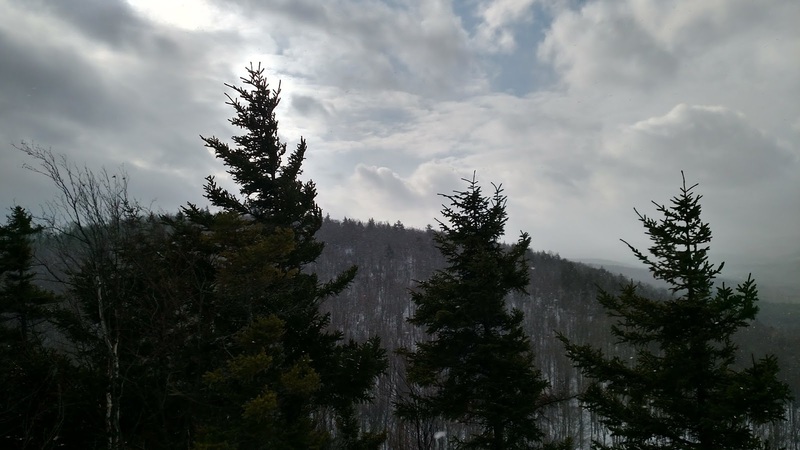 Balm of Gilead Mountain in the distance. Not quite summer beach weather... in fact there was a strong cold breeze. Looking south down the lake. 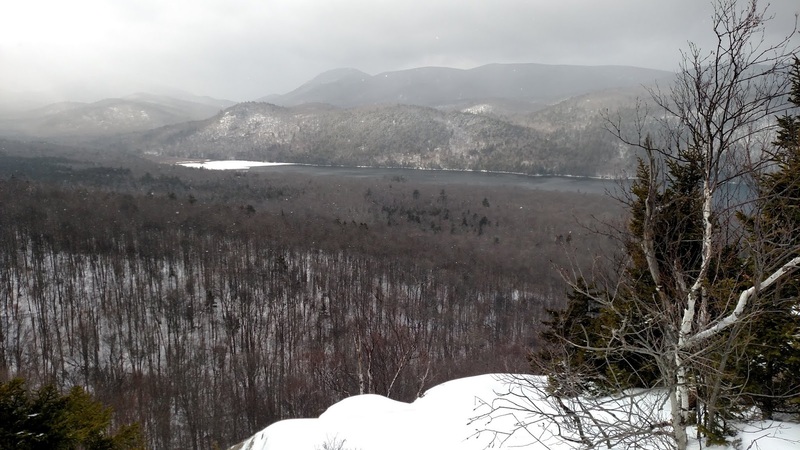 From Thirteenth Lake, we drove to Old Farm Clearing to take our short hike to Balm of Gilead Mountain. 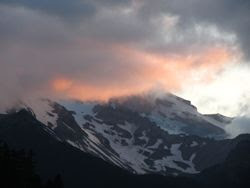 The mountain is encircled by the Botheration Loop which was designed for cross country skiing. It is a fantastic place to ski. Expert skiers have also been known to ski the trail to Balm of Gilead Mountain and on this day, we did indeed see old ski tracks in the snow. The climb portion of the hike is only 0.6 miles. It is moderately steep, but nothing that most people can't handle. Looking south from Balm of Gilead mountain to the higher un-named peak. On a summer day it would be well worth stopping on the summit for a lunch or snack. On this day however, we were greeted with a stiff breeze. We stayed 10 minutes to observe the scenery and take some pictures and then it was time to retreat to the cover of the forest. For us, it was a nice short afternoon hike for New Year's Day.